Enveloped, bullet shaped. 180 nm long and 75 nm wide. Certain plant rhabdoviruses are bacilliform in shape and almost twice the length. Negative-stranded RNA linear genome, about 11-15 kb in size. Varicosavirus genomes consists in two segments. Encodes for 5 to six proteins. GEOGRAPHY Rabies is present in all continents except for Australia and Antarctica. Vesiculovirus: Vesicular diseases, encephalitis Flu-like symptoms in human. TRANSMISSION Rabies virus: Zoonosis, animal bite. Vesicular stomatitis virus matrix protein blocks nuclear pores, resulting in host mRNA nuclear export inhibiton This shutoff of host gene expression prevents effective antiviral response by the infected cell. 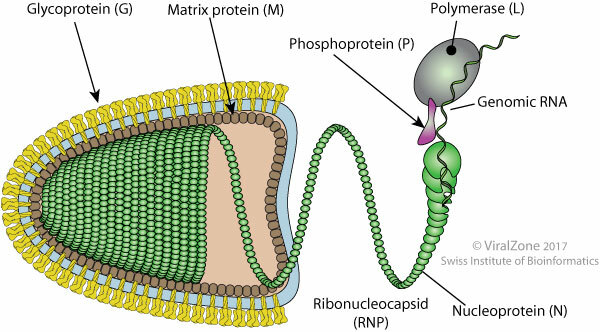 Rabies phosphoprotein may inhibit STAT-I antiviral pathway signaling by preventing nuclear localization of STAT dimers upon activation.